This Modular furniture was designed by Italy’s ZeroTreArchitetti and this modular system from Kube by Linea Italia lets you arrange all the pieces according to your imagination and design. Kube is available with seven varying versions of arm rests, back-arm rests and arm-back rests. If you want to connect PC, MP3 player and video game console you could use the feature of Kube arm rest Sound. 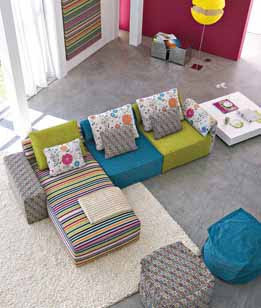 With this colorful pop modules pieces you could rearrange the layout of your furniture as often as you like. Try a new and unique combination and arrangements because Kube also has variety of covers. Transform your home into a playful environment with Kube by Linea Italia. style Modern Furniture is a term used to describe the romantic looks of dreamy French influenced furniture design. 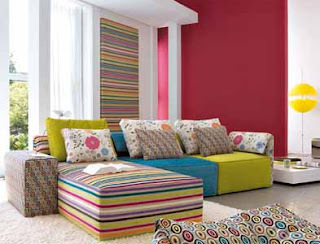 Looking so awesome list of colorful pop furniture and I really like it. Excellent modern furnitures!! I just loved the multi-colored pattern.